Penalties for not signing up for Medicare: Believe it or not, there are penalties for not signing up for Medicare. Now, it’s not like the federal government is forcing you to enroll in Medicare. But, if you don’t sign up during your eligibility window, you are going to face some pretty significant fees. To put it plain and simple, your Medicare is going to cost you more. This can get confusing, so if you have any questions, please give us a call at 844-528-8688. Medicare parts A, B, and D all have different penalties. In this article, we’ll look at each of them in detail and talk about everything you need to do to avoid the penalties for not signing up for Medicare. For most people, the Medicare initial enrollment period starts three months before the month that they turn 65 and ends three months after the month they turn 65. During that 7-month window, you are free to enroll in Medicare. But if you miss the deadline, you will face stiff monetary penalties for not signing up for Medicare. For Medicare Part A, this penalty is an extra fee you have to pay for your premiums. 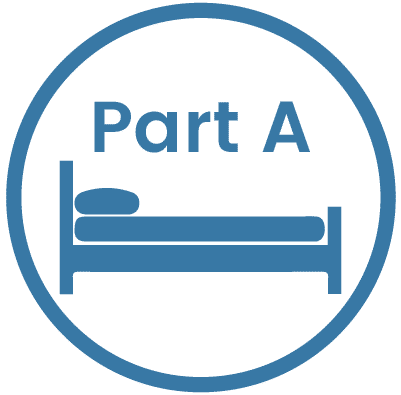 Part A requires no premium if you have paid Medicare taxes for at least ten years, and most people don’t have to pay Part A premiums. So, effectively, a lot of people can avoid late penalties for signing up outside of the enrollment period. If you aren’t eligible for premium free Part A, and you enroll late, you will be charged an extra 10% on your monthly premiums. This penalty will remain in place for twice as long as the time you delayed enrolling in Medicare Part A. For example, if you wait three years to enroll in Medicare, you’ll be paying the 10% free for six years. Unlike Part A, pretty much everyone pays premiums for Medicare Part B. That means that you are very likely to face penalties for not signing up for Medicare if you don’t enroll in Part B during the initial enrollment period. Even worse, the Part B penalty is much higher and lasts forever! So it is very important that you enroll in Medicare on time. If you enroll in Medicare Part B after the initial enrollment period, you will pay an extra 10% on your monthly premiums per year that you deferred enrollment. So, for example, if you delay enrolling for three years, you will pay an extra 30% on your premiums every single month. With the standard Part B premium at just about $135, that penalty would be costing you an extra $486 per year. If you are under an employer or union insurance plan from your employer or the employer of a spouse, you can put the Medicare part B on hold with no late penalty. Medicare Part D takes care of your prescription drugs. Although you may not be on any prescriptions during your initial enrollment period, it is usually a good idea to enroll in Part D anyway. For starters, it offers you peace of mind. But also, just like parts A and B, you will face penalties for not signing up for Medicare Part D during your open enrollment window. Specifically, Medicare law states that you will need to pay a penalty on your Part D premium if you go 63 days after your initial enrollment period without a qualifying prescription plan. Qualifying plans include Part D, a Medicare Advantage Plan, and outside prescription coverage that is at least as good as Medicare Part D (such as from a former employer or union). The Part D penalty isn’t quite as stiff as the others, but it will still add up over time because it is a lifelong penalty, just like the late enrollment fees for Part B. If you enroll in Medicare Part D late, you will pay an extra fee on your premiums: 1% of the “national base beneficiary premium” times the number of months for which you deferred enrolling. In 2019, the national base is just over $33. So, if you defer enrollment in Part D for 24 months, you would pay approximately an extra $7.92 in premiums every month. If you have creditable coverage form an employer, union insurance plan or the VA, you do not need a Medicare part D plan and will not be penalized if you do decide to choose one later in life. Hopefully, we’ve scared you straight into seeing how serious the penalties for not signing up for Medicare can be. If someone signs up for Parts B and D just 12 months late, and lives on Medicare for 20 years, they could be spending almost $4200 in unnecessary fees over the course of their lifetime. Whether you opt for Original Medicare (Parts A and B) or a Medicare Advantage Plan (Part C), make sure that you do everything that you need to do to get enrolled as soon as you are eligible. Although you have a seven month window, delaying until the end just leaves room for mistakes that could hold things up. If you find the enrollment process confusing or intimidating—or if you just can’t make a decision on the right plan for you—talk to a qualified Medicare agent. Our Medicare Solutions Team, for example, can help you find the best plan for you and get enrolled in time. And, our services are 100% free. Even if you don’t need it immediately, make sure you have some form of qualifying prescription drug coverage. For most people, this means choosing Part D if you are sticking with Original Medicare. If you choose an Advantage Plan, your plan should come with qualifying drug coverage. Some people get their prescription coverage from another source, such as a past employer. If this is the case for you, you’ve got to make sure that it counts as creditable drug coverage. Your plan provider will be able to tell you if it is creditable. If it isn’t, then it won’t protect you from Part D penalties. Either find a plan that does count as creditable coverage or enroll in Part D before it’s too late. Our agents are here to help you make the right decisions and avoid paying any penalties for not signing up for Medicare on time. Our services are free of charge, and we would love to hear from you. Give us a call at 844-528-8688 or use our easy online contact form to get in touch today.